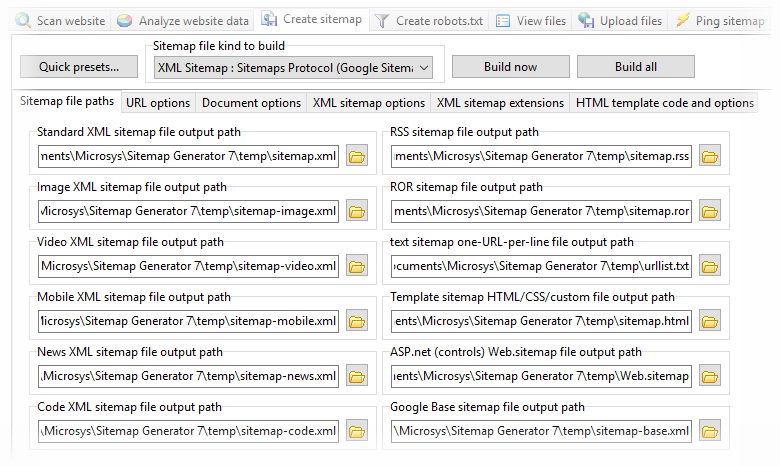 Creating XML sitemaps for your website can help search engines to index more pages faster. On this page you will find various links to resources which will help you understand all the details about XML sitemaps and how to create them. Some of the linked tutorials will be using our tools A1 Sitemap Generator and TechSEO360. They both run on Windows and Mac, both come with a fully functional 30 days trial period and both share the same functionality when it comes to sitemaps. Tutorial on how to create standard XML sitemaps. Tutorial on how to create video sitemaps. Tutorial on how to create image sitemaps. Automate and schedule XML sitemap build, upload and ping with the command line inteface (CLI). Forum at WebHelpForums for general webmaster help on everything sitemaps. Forum at WebHelpForums for helping webmasters specificly on how to use A1 Sitemap Generator. Here is a collection of articles containing general information about XML sitemaps. The official specification/protocol for XML sitemaps. Help page by Google about video sitemaps - an XML sitemaps extension. Help page by Google about image sitemaps - an XML sitemaps extension.